If your answer is “YES” to most of the points below, then you are a Hyderabadi! Your answer is ‘Seeedha Chale Jao’ when somebody asks you for directions, whether it is to Malakpet, Masab Tank, Malkajgiri or Moosapet. You have at least one cousin, friend, colleague or acquaintance in the US in software. You crave for Pani Puris, Bhel Puri, Pav Bhaji and Mirchi Bajji etc., though you have many restaurants serving exotic food around. And as said in the last point, I started craving for some spicy chat food from the moment I saw the JFI event hosted by SaffronTrail this month. 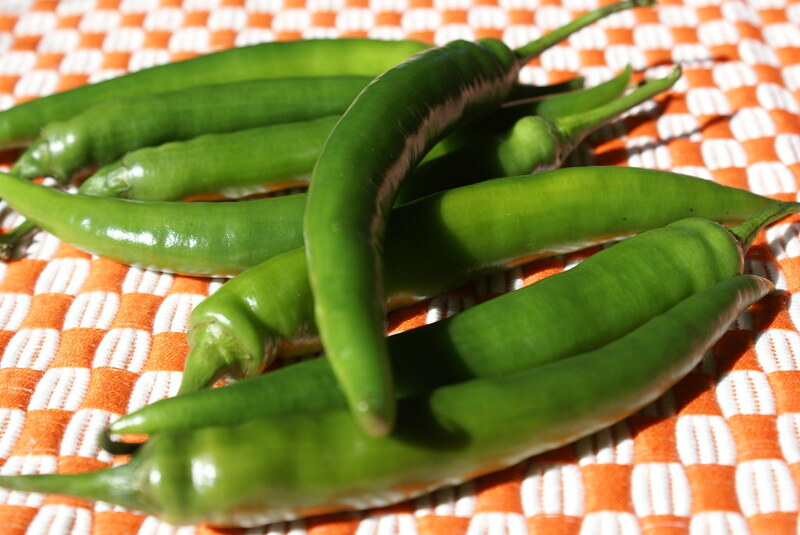 And the ingredient for the month is Chillies, and what could be a better option to choose for the event – Mirchi Bajji. So here is the recipe for it. 1 cup Roasted peanuts, ground to coarse/fine powder. Wash the chillies, make a slit on one side of the chillies, with ends intact and carefully remove the seeds. Mix gram flour, rice flour, salt, baking soda, salt, ajwan and make a thick batter. Heat oil in a wok, dip the chillies one by one in the batter and deep fry them. 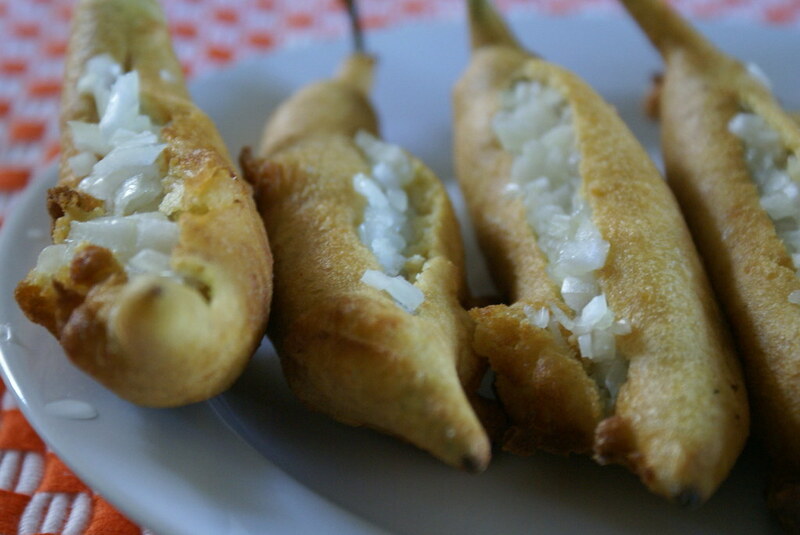 For serving, make a slit on fried mirchi bajjis, sprinkle with some chat masala, chopped onion. What can I say, I went back 5 years to my college days at the very first bite… Ummm… it reminded me of Hyderabad once again. A perfect companion on a lazy, cloudy or rainy evening, teamed with a cup of hot chai. I have added your blog to my blog roll and also to my RSS feeds so that I never miss another of your posts. 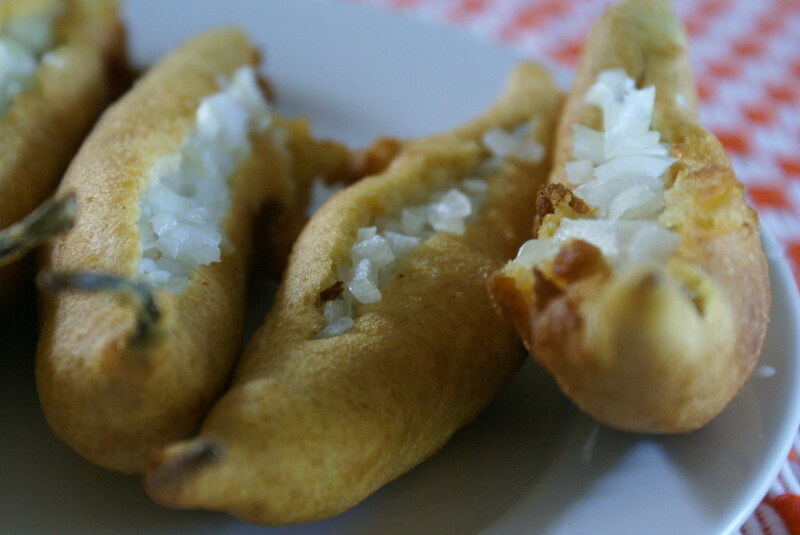 The stuffed chillies photo is beautiful. I like the perspective of that shot. Cynthia… Thanks for the comments… They were just few points which explain the mindset of typical Hyderabadi’s 🙂 Iam glad that you had a laugh! Suganya…Thanks for the Food Blog Desam suggestion. I have sent a mail to them, hopefully mine will be added soon! 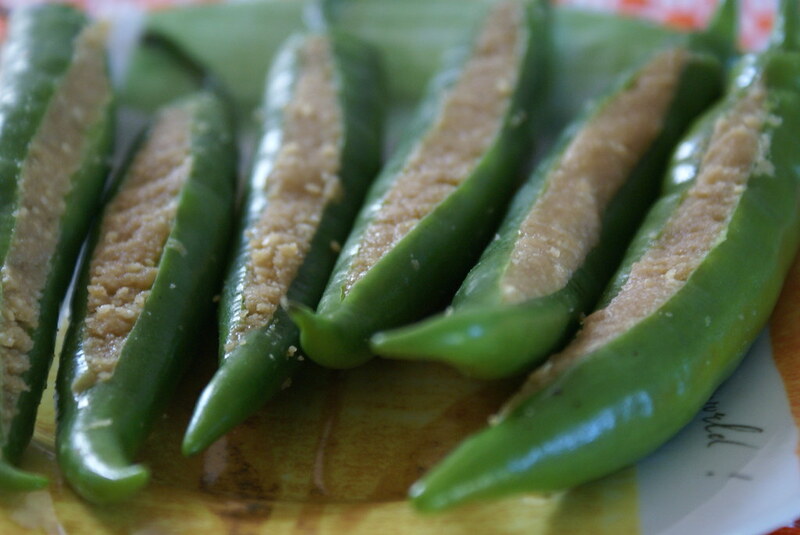 Hey, this is my all time favo snack and specially those rainy and snowy days with a hot cup of masala tea..
calms my appetite and warms me up! This cracked me up. The stuffed mirchi looks great ! Love Mirchi bajjis. I too posted one version on my blog and submitted to nandita. nice way to know if you r a hydrabadi.what about people telling u ‘full style marleri’ and ‘wohech re’…miss hyd. love the bajjis, my favorite, i would take detours to my fav. bajji stands to pig out on them. Wow..the stuffed mirchi looks great. I love Mirchi bajjis. Will try it out soon. Thanks so much for sharing.